Computes the geometric intersection of 3D line features and one or more surfaces to return the intersection as segmented line features and points. All of the input line features will be in the output line feature class even if they do not intersect a surface. OID_ORG—The OBJECTID from the original 3D line feature. SURF_FROM—The surface from which the 3D line segment began. SURF_TO—The surface from where the 3D line segment was drawn to. OID_LINE—The OBJECTID from the original 3D line feature. SURFACE—The surface name where the intersecting point is generated from. DIST_ALONG—The distance from the beginning of the 3D line to the point of intersection. 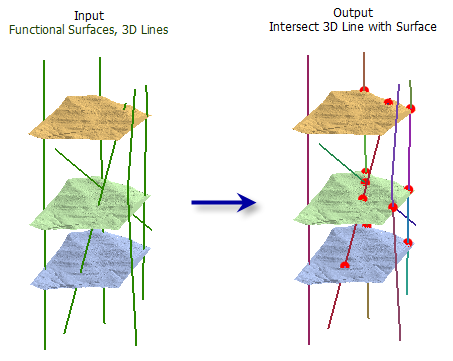 The input 3D line features. One or more surfaces that will be used to determine the points of intersection. The output line features that represent the input line features split at the points of intersection with the surface. The optional point features that represent the input line's intersection with a surface .